Apple needs to announce a much better iPhone 7 camera in two months in order to keep up with its rivals, and more and more it looks like it'll do just that. There's a new iPhone 7 spy shot on 9to5Mac today, and while the leaked photo can't be confirmed, it does shows a larger rear-facing camera. It could give your 12MP iSight photos a major boost. That's good news for everyone who has been struggling to match their friends' more vibrate and low light toppling Samsung Galaxy S7 and Samsung Galaxy S7 Edge pictures. The iPhone 7 Plus camera module is rumored to be undergoing even more changes. Most of the reports I have seen indicate it'll use a dual camera system just like the LG G5. Studying the the photo a bit more, it's obvious that the alleged iPhone 7 camera has shifted a few fractions of an inch toward the corner. It's hugging the left side more than the iPhone 6S does now. 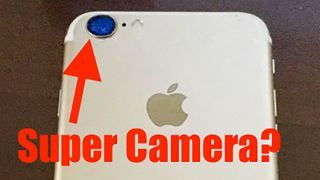 A little disturbing is that the leaked image, while grainy, shows a camera bulge that no one wants. Rumors earlier this year said that it's going away entirely, but like Samsung's phones, it looks reduced in size. Overall, the new iPhone 7 does sport a cleaner design, with the white antenna lines moved almost out of sight, along the top and bottom of the phone frame, not straight through the back side. My last observation is the bottom speaker: there's just one. Previous leaks and blueprints have shown two. Does that upend the validity of this spy shot, or are two speakers destined to be iPhone 7 Plus exclusive? There are a little over two months left in the iPhone 6S and iPhone 6S Plus cycle, meaning, in between now and mid-September, I expect to see more iPhone 7 rumors. That I can guarantee.